For several days the North American Rare Bird Alert has reported online that at Sabal Palm Audubon Sanctuary south of Brownsville, Texas, a single female Masked Duck and several Yellow-green Vireos have been seen on a regular basis. Both species are rare in North America (ABA # 3s). Having never seen either of them, and having nothing better to do, I headed out for Texas last week and was excited to locate both birds. Others were there for the same purpose, many successful and some not. Everyone was most cordial and helpful to one another, a common characteristic of birders I have met over the years. It was of mild interest to me that of the dozen or so birders there for the same purpose I was, all were men. One was doing a “Big Year”. The heat index was 103, the wind was gusting at 40 miles per hour, and the “dry jungle” which Sabal Palm is, was muggy and uncomfortable. This, of course, added to my satisfaction of finding these two great birds. Actually, there were 4 Yellow-green Vireos, apparently reflective of a successful nesting effort. My first “identification” of the somewhat distant Masked Duck is suspect, because when I returned later I thought I saw three of them, again at quite a distance. I really needed a scope, which I had left home to make my air travel less cumbersome. These 3 all turned out to be the somewhat similar and far more common Ruddy Ducks. 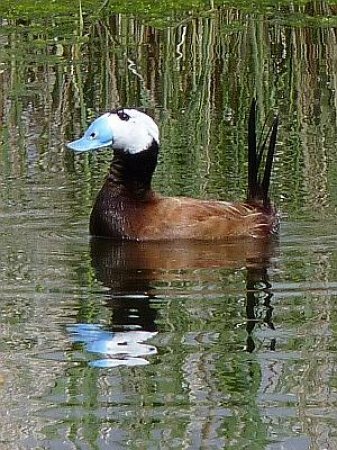 And so I lingered long at the blind until, fortuitously, the real Masked Duck appeared close at hand enabling me to clearly see the three black lines across the face, and confirm its identity. North American birds number 703 and 704 are now securely on my list. As you may have read in earlier posts on this blog, in late February and early March of this year my wife and I, with our daughter and son-in-law, toured in Spain and Portugal for a couple of weeks. For the last day of that trip I hired a Madrid-based bird guide, John Muddeman, for one day of birding near Madrid. I enjoyed it so much that I arranged to go back again in late April for a 6-day birding tour of central Spain with John as my guide. My decision to return to Spain so soon was based on: (1) my review of my 1998 edition of the Collins Guide to the Birds of Europe, (2) my discovery during that review that I had seen many of the European birds in various places in prior years, and particularly in Spain on my earlier trip, and (3) the conclusion that in late April or early May, I could see in central Spain a majority of the European birds that I have not seen. Working with John by email, we compiled a list of 50 potential new species that could possibly be seen in 6 days within the 100 mile or so radius of Madrid that we settled on as our route. On the first day out we drove north of Madrid, ultimately spending the night at Sepulveda. This small village in Segovia Province was spectacular in its location and the compatibility of its old buildings with the surrounding mountains, fields, and river. Driving in late afternoon with the sun-glow on the lovely old, light tan buildings was an unforgettable experience. Our lodgings in an old downtown hotel were antiquated but comfortable and the food at the local restaurant (lamb ribs) was good. 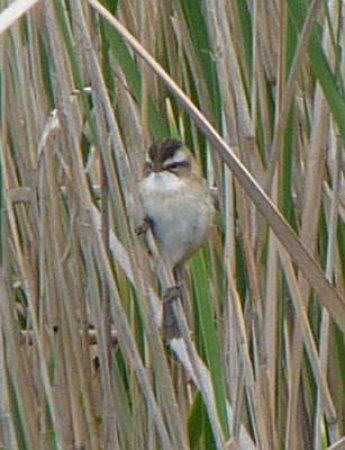 As for the birding, the first day resulted in the following new 17 species: Booted Eagle, Melodious Warbler, Western Bonelli’s Warbler, Orphean Warbler, Firecrest, European Pied Flycatcher, Calandra Lark, Greater Short-toed Lark, Woodlark, Dupont’s Lark (very rare and difficult to find), Northern House Martin, Woodchat Shrike, Black-eared Wheatar, Cirl Bunting, Ortolan Bunting, Citril Finch, and White-throated Dipper. A real highlight of the day was a close-up view of a herd of about 30 wild Spanish Ibex. Their numbers had been very low until the past few years, when legal protection and habitat preservation have allowed them to recover to some extent. Other mammals that we saw during the 6-day trip included Red Deer, Fox, Rabbits, and Jack Rabbits. Greater Flamingo (by the 1000s), Montagu’s Harrier, Whiskered Tern, Eurasian Reed Warbler, Great Reed Warbler, Spectacled Warbler, Rufous-tailed Robin Thrush, Cetti’s Warbler, and Bearded Reedling. Concern for the protection of a rare (in Spain) 11th species, primarily from over-zealous photographers, requires, at John’s request, that I not identify it. Our lodgings and food were far from ideal that night. I doubt that John will return there with other clients. Day 3 we birded our way to Daimiel. The habitat types were quite varied. 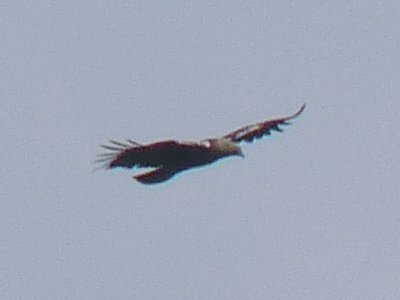 Thirteen species were added: Little Grebe, European Honey Buzzard, Marbled Teal, Common Quail (heard only), Water Rail, Curlew Sandpiper, (unexpected find), Great Spotted Cuckoo, Little Owl, European Bee-eater, Savi’s Warbler, Eurasian Reed Bunting, Eurasian Golden Oriole, and Pin-tailed Sandgrouse. Our lodging tonight made up for the deficits of the preceding night. Very nice and very inexpensive. 41 species tallied to date. Day 4 we proceeded westward and northward on a long drive through Extramadura Province. The weather was uncooperative, rainy and windy, so our birding was hampered. Nevertheless we managed another 6 new species: European Turtle Dove, European Roller, European Green Woodpecker (finally, we’ve been looking for days), Black Wheatear, Garden Warbler, and Moustached Warbler. Day 5 we headed north toward Manfrague National Preserve. This is a lovely, nicely preserved large natural habitat, expecially for hawks, eagles and vultures. We stayed at the rustic park Inn, which was nice enough, and the dinner served as part of the package (Red Deer) was very good. Today we added 4 more species: Black Stork, Little Tern (magically, it seems, it appeared on a flat-water temporary pond where we were looking for shorebirds), Whinchat, and Subalpine Warbler. We had a considerable amount of success. Tally: 51 species. Day 6 we started the morning where we left off the evening, and due to John’s sharp eyes, succeeded in locating both a juvenile Eurasian Eagle Owl and and well disguised adult. Great views. Next we had a smashing view of a close above Spanish Imperial Eagle. 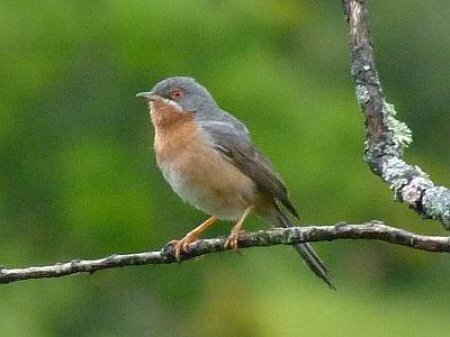 This is one of only two species found only in Spain, i.e., a bird “endemic” to Spain. I had seen one on our earlier trip, so it was not new, but the view this time was terrific. 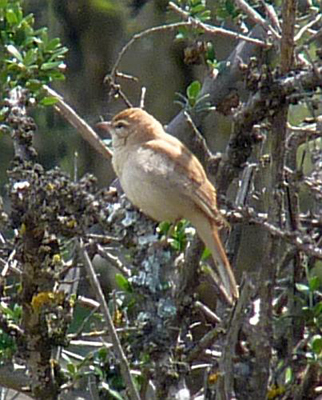 (The Iberian Chiffchaff, which we did not see, may be an endemic, although it may also be in Portugal). The Spanish Imperial Eagle was recently split from the Imperial Eagle because those on the Iberian peninsula are clearly different. At this point, near mid-day, we were down to one potential new species, the Rufous-tailed Scrub Robin. Reclusive and usually limited to cultivated olive groves and their environs, we headed eastward toward Madrid in hopes of finding this last target. 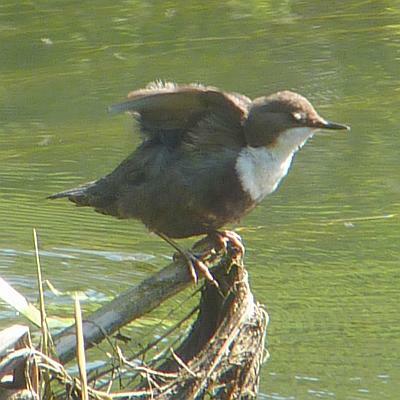 John communicated with a fellow in a small town half way back to Madrid, who had reported finding these birds in his area. He readily volunteered to meet us and lead us through the maze of olive groves to the potential site. 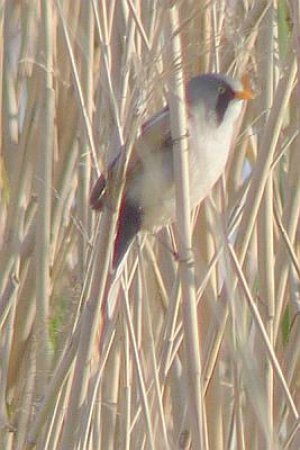 After an hour or two of searching, during which the bird could sometimes be heard but never seen, sharp-eyed John located it in an old olive grove by a pig-sty, and we had very good and satisfactory views, of this, my last new species of the trip. John’s friend insisted on buying a round of beers for us as we departed. The total, an amzaing 53 new species (one heard only), and a trip total of about 175. John will be surprised at the number 53, because at the time I thought I was on 49 trying for 50 as we searched for the Rufous Scrub Robin. I can’t account for the mis-count, although I was not then including Common Quail, because it was heard only. Interesting non-avian sightings included a Sooty Orange-tip La Mancha, a Narcissus Rupicola, a Common Midwife Toad, a Parsley Frog, and lovely Rosemaria, among many other butterflies, dragonflies, damselflies, newts, lizards, frogs, toads, turtles, snakes, and other creatures noted by John for my benefit, on this much more than a birding adventure. On May 30th, 2011, my list of North American Birds reached my long-sought-after number, 700: Calliope Hummingbird. Actually, I saw several of them in the east Cascades, one in the willows at the reservoir at Conconully and several at a summer home in the Entiat River Valley. On May 28th I was in Seattle for my sister’s 90th birthday party, after which I took a couple of extra days to drive over to the east Cascades where the chances of finding Calliopes (and Cassin’s Vireos) are good at this time of year. But first, I must mention that I was very happy to be my sister’s golf cart driver on the morning of her 90th birthday (91st birthday, 90th anniversary of her birth), when she came so close to shooting her age: a 93 on the Lynnwood course. She just needed to shoot (used in its golfing context, not in its hunting context) a darn Eagle (double Eagle?) on the 18th hole to “shoot her age”. She had a good round anyway, so away with all the 90-91 technicalities. Several members of her family participated in the golf outing as a prelude to a delicious afternoon dinner at her son’s home overlooking Puget Sound. I don’t play golf, having pursued the superior, equally time-consuming and far less frustrating hobby of birding many years ago. Even though golf is boring, it was a lovely and interesting day in the company of my wonderful sister and her equally delightful kids. [I know, I know: I do overuse the parenthesis sign]. With the addition of the Calliope Hummingbird and the Cassin’s Vireo to my North American Life List, I now have only one more ABA “1″ rated (e.g., easy to see) bird to find: a Purple Sandpiper. I think the number of ABA ”1″ birds is 500 or close to it, so I have now collected views of ~499 of the ~500 “easy” birds to find in North America. It would have been fun to have something rare, like a Blue Mockingbird, for number 700, but I was just as happy to come within one of completing my sweep of the “easy” ones. The Cassin’s Vireo became North American number 701. Part of my determination to find these birds on this trip is that I understand that effective in August the American Birding Association will “split” Mexican Jays into two species, the Arizona type and the Texas type. I have seen both, so by default, as of August, I would have had to include on my list one of these as number 700 even though I saw it (them) several years ago. That would be so anti-climactic. So now, split away, ABA. One of the pleasures of birding is that you meet very nice and helpful people in the field or on the internet when you are looking for a bird or researching locations. In this case, I am especially thankful to Don Hester, owner of NCW Home Inspections, whose blog includes much more than just home inspection information. He is a birder, or at least a bird photographer, and he puts excellent photos on his blog, which is how I found him through Google. 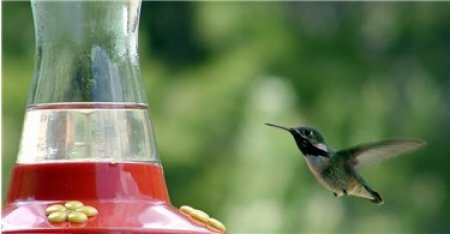 He has allowed me to include this photo of a Calliope Hummingbird, taken at his feeders at his summer home in the Entiat River Valley. It may be the same bird and the same feeder that I saw there. Unfortunately, my wife and photographic expert was at a horse show in Madison, WI, winning her first blue ribbon of the year with her beautiful horse, so she missed this photographic opportunity. Even though she hated to miss the birthday celebration and my number 700, she would probably elect that option again. Life is full of hard choices. For more of Don’s hummingbird photos, you can check his blog at ncwhomeinspections@gmail.com.